Home › Electronics › Laptop Briefcase Backpack Evecase Unisex Lightweight Convertible Laptop Messe.. Laptop Briefcase Backpack Evecase Unisex Lightweight Convertible Laptop Messe..
3-in-1 Multi-Purpose: Sleek and versatile design, the bag is convertible for use as briefcase, messenger bag, or backpack depending on need and carrying preference. Resistant Design: Made with water and weather resistant thick fabric with heavy duty and hardware and zippers for maximum durability and protection. Extra Protection: Padded laptop compartment and interior to provide extra cushion for electronic accessories. Travel safe lockable zipper for protection against laptop theft. Ergonomic Straps: Padded messenger and backpack straps for reduced body stress and comfort wear. Soft vegan leather padded handle grips and zipper pulls. Size: 17.3inch | Color: Black The Evecase Multi-Purpose Backpack is designed to offer ultra-portable andversatile carrying options for a 17.3 inch laptop and other essential items.The bag comes with soft grip handles to carry as a briefcase, a removable andadjustable strap to carry as a messenger / shoulder bag, and easy to hide andaccess shoulder straps to wear as a backpack. Utilize the bag to carryingpreference. Perfect for work, school, commutes, travel, trips, and day to dayactivities. _Specifications_ â€‹Dimensions: 18.50 x 13.5 x 6 inches Includes: 1x Convertible Bag with Hidden Handles and Backpack Straps & 1x Messenger Strap Weight: 57.14 â€‹oz Fits Laptop / Ultrabook / Chromebook / Macbook 17 inches up to 17.3 inches Popular Compatible Models Include Apple Macbook Pro 17-inch Laptop Acer Aspire V Nitro VN7-791G Series 17.3" ASUS ROG GL752VW (17.3"), X751MA, X750JA, GL771, ROG GL551JW, X751MA / X750JA 17 inch Dell 7000 17" 2-in-1 Laptop, Inspiron 17 5000 Series 17.3" Laptop HP ENVY 17/17t Series, Pavillion 17 / 17.3 Series, ZBook 17 G2 17.3" Lenovo Ideapad 700 (17.3"), ThinkPad P70, Z70 / Y70 17.3" Toshiba Satellite C75D 17.3" Laptop Please Note: This is a universal carrying case, it was not designed for any specific model. LCD display size does not reflect actual device measurement. Be sure to verify exact dimension of your device against the case interior dimensions to ensure proper fit. 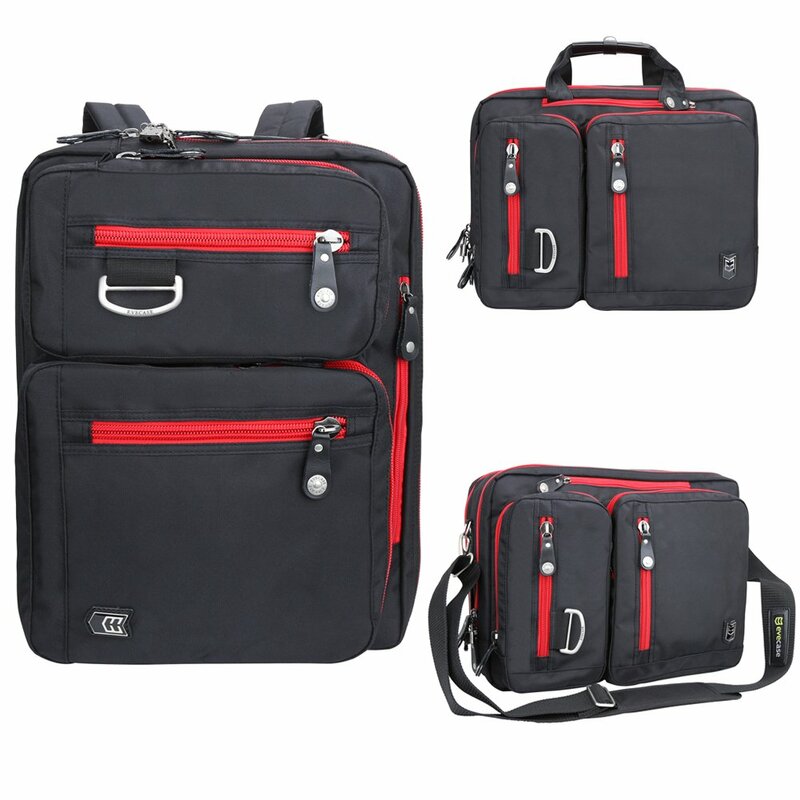 Versatile Design _3-in-1 Multi-Purpose Carry_ Sleek and versatile design, the bag is convertible to use as briefcase,messenger bag, or backpack depending on need and carrying preference. Extra Protection _Resistant & Durable â€‹_ Made with water and weather resistant thick polyester fabric with heavy dutyand hardware and zippers for maximum durability and protection. Paddedinterior and extra padded laptop sleeve to provide extra cushion forelectronic accessories. Accessible Storage _Plenty of Storage Options_ ~ 2 Large front pockets with secure divided storage and pockets ~ 2 smaller quick-access front pockets ~ 1 large main laptop sleeve compartment with mesh inner pocket ~ 1 large main compartment with built in dividers.